High quality fleece lined boots for dogs that have been proven a winner for dogs and their owners. Conceived by Marianne Bertrand, an entrepreneur and dog owner,These boots are not just fancy footwear for canines. Made in Canada and provide comfort, protection and durability to keep paws healthy and warm. Since their introduction in 1994, Muttluks high quality boots for dogs, have proved a winner with dogs and their owners. Conceived by Marianne Bertrand, an entrepreneur and dog owner, Muttluks are not just fancy footwear for canines. Made in Canada, Muttluks provide comfort, protection and durability to keep paws healthy and warm. The name Muttluks is derived from the original Inuit sealskin boots known as "mukluks". The Inuit mukluk, tried and proven under Arctic conditions for hundreds of years, has a legendary reputation as durable, warm and water resistant. Inspired by the original, Marianne called her dog boots "Muttluks". The result is a high quality boot for dogs that is not only practical, but also visually appealing. Available in black only. Each order contains four boots. NEW All Weather Muttluks are made with breathable, waterproof Hydroflex coated fabric. 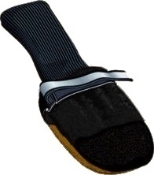 The fleece Muttluks are made with soft and warm fleece fabric. New leather toe protection (on size M-XXL). Sizes Itty Bitty to Small have Cordura toe protection. A self tightening fastening system allows for easy, secure and quick fastening. 3M Scotchlite reflective material provides safety and nighttime visibility. The comfortable stretchy cuff is versatile and easily adapted for dogs with short or long legs. Muttluks come in eight different sizes to fit breeds from Chihuahuas to Great Danes and everything in-between. Muttluks distinctive packaging, complete with paw fitting chart makes it easy for pets to be sized on the spot and offers strong sales support at retail.